Here's an example of what makes watching Brett Favre and the Packers (the only socialist team in major league sports) so much fun to watch. 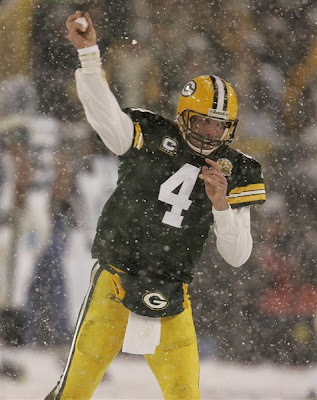 In this photo, Favre takes some time to have a snowball fight in the middle of the game, nailing teammate Donald Driver. Driver later got him back in the middle of Favre's post-game interview with a snowball to the helmet. Favre clearly enjoys playing football, which makes it more fun to watch. -Brett Favre after the Seattle game. OK, this is excellent. I'll throw this vignette into conversation at the water cooler tomorrow. Packer leverage is so mighty in my office that on the Friday before the game, 9 women wore Favre jerseys over their business-casual office wear. Could you please publish a few more sayings, expressions or stories for the non-Packers in Madison. How's about "Winning isn't everything, it's the only thing!" which I believe was uttered by the late and fairly great Vince Lombardi. Or this one: "I can't believe we lost to the Bears TWICE this year. Darn." Brett Favre. I'll probably miss the game since I'll be in a city far away which has a mediocre football team, but I hope the Packers win. Of course. "If you aren't fired with enthusiasm, you'll be fired with enthusiasm." OK, but he still buddied around with Tommy Thompson.